Hexacopter pilot charged with felony. Kele Stanley, an Ohio man, is facing felony charges after flying his remote-controlled drone over an accident scene on April 12, 2014 in Moorefield Township, Ohio. The Columbus Dispatch reports that Kele Stanley is charged with misconduct at an emergency scene and disorderly conduct and later with the additional charge of obstructing official business, a felony in Ohio. The videographer was alerted to reports that a pickup truck crashed into a tree in Moorefield Township. Stanley arrived at the scene and launched his hexacopter flying it about 75 feet over the accident. Deputies say they asked Stanley several times to land the drone to make room for a medical helicopter that had been called in to airlift the victim to a local hospital. Stanley disputes that he was told about the medical helicopter, insisting he would have landed immediately had he known that. 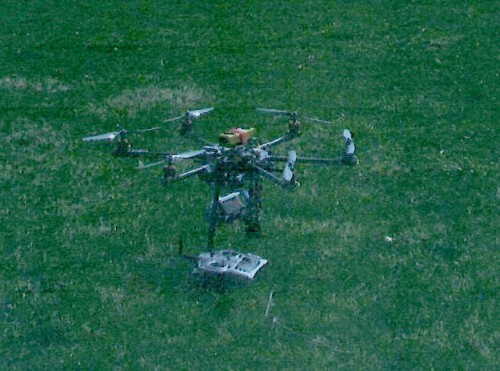 Deputies took a picture of the drone along with the controls on the ground after the incident. The 31-year Stanley is a copy-machine repairman who also videotapes weddings and often shoots video with his drone and gives it to television stations in his area. He posted bond Saturday and returned to court Monday for an initial hearing, where the felony charges were added. Stanley says there are no laws in Ohio that prohibit him from flying the drone, so after he was approached by a deputy and landed the drone, he then put the craft back in the air. He argues the deputy asked him to land the drone again, but never mentioned a medical helicopter being called into the scene.